If you have ever dealt with molds before, then you must know how difficult it can be to remove them. What you probably did not know, however, is that molds and mildew spores could be dangerous to the people exposed to them. Exposure to molds has been associated with symptoms like itchy skin and eyes, wheezing, and a stuffy nose. Fortunately, you can get eliminate molds and mildew spores from your home completely. All you will need is an air purifier. Getting the best air purifier is the first step of clearing molds from your home. However, with the many brands of air purifiers that you will find in the market, it can be daunting to pick the best to take care of your mold problem. We have compiled a review of five best air purifiers that you could use to remove mold and mildew spores. We have also included a buyer’s guide to make it easier for you to pick the best model for your needs. If you are planning to invest in an air purifier, you will want to get an excellent one to enjoy the best results. 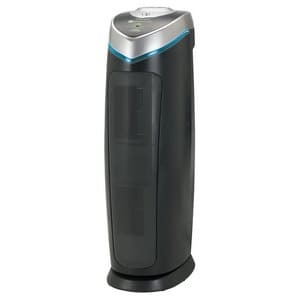 GermGuard is one of the best air purifiers that you can get in the market today. The unit features UV-C technology that makes it perform better than most of the air purifiers that you can get in the market. It comes fitted with a HEPA filter that has the ability to trap up to 99.97 percent of allergens, dust, pet dander, mold spores, and plant pollens. It has a three-speed setting that is versatile enough to make this unit effective at filtering even medium-sized rooms. GermGuard AC4825 also comes fitted with durable filters that can last between 6 and 8 months depending on where you use it. With its long lasting filters, you will definitely get value for your money since most filters require frequent changing. If you are looking for the best all-round air purifier that delivers the best results and has an effectiveness that exceeds its price range, then this is the ideal unit to buy. If you are looking for the best purifier for mold and mildew to tackle large rooms, then Alen BreatheSmart Fit50 is the unit to look out for. This is because it clears up to 900 SqFt in every 30 minutes. It features propriety whisperMax technology that is responsible for its quietness while its soothing pink tones enhance sleep quality. 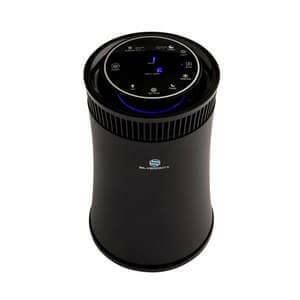 This makes it an ideal air purifier for use in bedrooms. The unit also features intuitive intelligence with a smart sensor that detects airborne particles as low as 0.3 microns while its air quality indicator light shows the quality of the air in a room in real time. It also comes fitted with Auto-Mode that self-adjusts its fan speed with the aim of addressing the ever-changing indoor environment. With this unit, therefore, you simply sit and breathe easy. This unit is built with an ozone-safe ionizer that makes the air purifier effective in cleaning your indoor air. It does this by creating negative ions that attract and clump even the very fine particles so that the HEPA filters can trap all the dirty air. Has a three-timer setting: 2 hours, 4 hours, and 12 hours. If you are looking for the best air purifier to use in your large living room to remove allergens, molds, and pollen from your large room, Alen BreatheSmart Fit50 is the ideal pick. This air purifier delivers a powerful performance despite being compact and lightweight. SilverOnyx is designed with 5-stage filtration that enables it to trap both large particles like pet dander and ultra-fine particles like dust while neutralizing your indoor odors. It comes with HEPA H13 filter that is well-known for filtering ultra-fine particles and capturing up to 99.97 percent of allergens, dust, and the smallest particles. Moreover, it comes fitted with built-in ionizers and UV sanitizers that are important at removing molds, mildew, and other harmful germs from your indoor environment. Its design incorporates easy to use functionalities. It features easy-to-use push buttons and displays that give you easy access to the variable 5-speed fan, UV-light, on/off timer, built-in ionizer, as well as the auto mode. Its lightweight and compact design makes it an ideal unit for pet owners and smokers with a room no more than 500 SqFt. The 2.5 sensor automatically adjusts the flow of air to ensure you get the best air quality. If are looking for the best air purifier for your small room then we highly recommended SilverOnyx as it’s perfect for your needs. 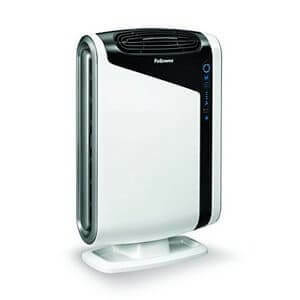 This AeraMax 300 air purifier is designed ideally for people who want an air purifier unit for their large rooms but are economically conscious. It comes fitted with HEPA filters together with activated carbon to trap all pollutants from your indoors. This means that it clears 99.97 percent of the allergens and pathogens. It comes with four speeds with the lowest speed being the most silent and most economical. At this setting, the unit consumes only 6W of energy, which means that you will save on energy bills. However, if you are removing molds and mildew, you have to use the highest speed setting that will consume 86W. The unit comes with a 3-year warranty, which provides enough time for you to decide whether the purifier is best for you. This air purifier unit is strongly recommended for those who want the best economical air purifier that performs great at trapping dust particles and removing molds. The air in your home should be clean and fresh. To maintain the freshness of air, however, you must have the most efficient air purifier in your indoor space. 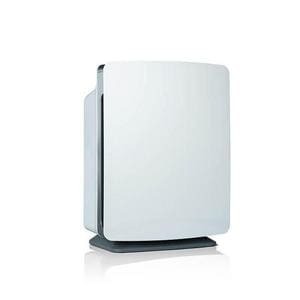 Such a purifier is Levoit LV-H132 Air Purifier. It is designed to be 100 Percent ozone free without using UV or ions that produce harmful traces of harmful pollutants. It features three stages of filtration that removes up to 99.97 percent of dust, allergens, smokers, mold spores, pet dander, and other small and large particles. The 3-speed setting (low, medium and high) offers different conditions. It can also operate quietly throughout the night without disturbing your sleep. It also comes in a uniquely small size with a modern classy design that makes it a perfect fit in small rooms and offices. Moreover, its integrated filters are easy to install and are durable. 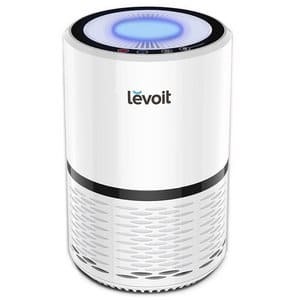 If you are looking the best value air purifier for your office or small bedroom, then we recommend Levoit LV-H132 Air Purifier. It’s also the perfect gift for that friend with a small room or office. What are the main features to look out for when buying an air purifier? Don’t accept compromised filter quality. An air purifier that has at least a 2-stage filtration system is best. When buying a unit, consider acquiring the model with a HEPA filter and activated carbon filter. These are the filters that will ensure the mold spores are efficiently removed with their odor from the air. Picking an air purifier with different fan speeds comes in handy because it is efficient at controlling the rate of air being circulated. When molds come into play, you can set the highest setting to get a detailed clean. You can also set a low speed during warmer seasons. Air purifiers are designed to clean the air in specific room sizes. For instance, one purifier can be designed to handle air in a 400 square feet room while another can do up to 1000 square feet. As such, you need to know your room size and pick the purifier accordingly. An automated air purifier comes with sensors to detect odors, smoke, and impurities before setting the fan in motion. This implies that you won’t have to set the unit manually. You simply let the unit do the job for you. You won’t like to have a noisy air purifier in your home. No one wants to have his or her peace of mind compromised. So, be sure to pick one that operates silently. When out shopping for an air purifier, you don’t need to spend too much to have the best air purifier to remove molds and mildew spores from your home or office. All you have to do is find a model that delivers great performance while still being truly inexpensive. You can even start by considering the five models that we have reviewed above. You can also subscribe to our blog to learn more about air purifiers and related products in our subsequent reviews.